As temperatures drop and snow piles up, the weather in Ottawa can certainly be daunting in the winter. It’s more challenging to get out and about, especially for the clients we serve who may have disabilities and mobility issues. At this time of year it’s especially important to be receiving a hot meal at lunchtime. 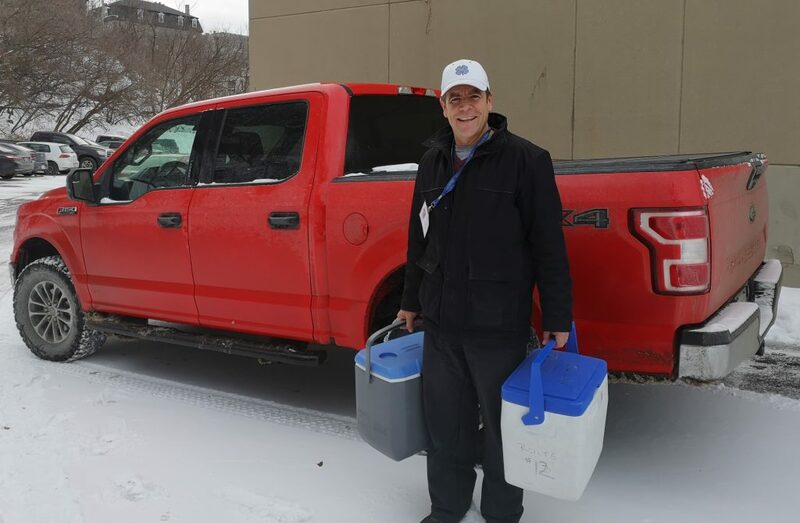 At Meals on Wheels, we make every effort to ensure uninterrupted service to our clients so that they can count on this daily lunch delivery as well as the weekly frozen deliveries. We simply couldn’t accomplish this without our dedicated team of volunteers. They are bringing, not just important nutritional support, but also a friendly smile and a check in which can be even more valuable at this time of year. The steps our volunteers take to be prepared for winter driving are an important part of the continuity of the service. These winter warriors are out there ensuring meals get delivered and that takes a little bit of extra planning. Some of the ways volunteers plan ahead are by ensuring they have winter tires on in plenty of time for the change of season and having their vehicles serviced and winterized so as to be ready for winter driving and road conditions. Stocking up on salt, keeping the gas tank full and giving extra time to clean off vehicles to arrive on time for the meal pick up all help to keep the wheels rolling at Meals on Wheels. “The dedication and reliability of our volunteers is pretty incredible. Our volunteers care so much about our clients. They know if they don’t get there that the client won’t get a hot meal and may not even see anyone that day” – Jill Daigle, Manager of Volunteer Services. Clients should be aware that, although we strive to get all meals delivered, there may be times when some deliveries will be suspended, either because we have not been able to replace a driver or the volunteers have not been able to access the home due to conditions. It’s important to always ensure that you have something on hand in case we are not able to deliver your hot or frozen meals. Consider having shelf stable canned goods or extra frozen meals during winter months in the event of any service interruptions. But rest assured we will do our best to get to you! For information about our frozen meal program to supplement your hot meal delivery visit our website here www.mealsonwheels-ottawa.org/meal-programs/frozen-meals. Volunteers who are confident driving in the snow, please let us know. Some of you, like Mark, have vehicles that are better equipped to handle stormy winter road conditions. If you would be prepared to step in for an extra delivery in the event of inclement weather, please consider joining our team of spare winter warrior drivers. We will be compiling a list of volunteers who are able to pick up extra routes. In addition, during the winter months a number of our volunteers have headed south so if you have a family member, friend, or neighbour who would be willing to help out over the winter, please consider asking them to join our team!